Don't let your flawless business plan be overshadowed by your dining faux pas. Don't hassle over the check. If you've asked a client out to lunch, always pay. Better yet, discreetly give the maitre d' your credit card before your guest arrives to avoid a potentially awkward situation when the check comes at the end of the meal. The only exception to this rule is if your guest is a government employee or is otherwise restricted from accepting meals. Don't try out the latest, greatest restaurant. A client lunch isn't the time to try out a new establishment and risk bad service or bad food. Choose a restaurant familiar to you. The best choice is a place you've dined at often. Better yet, pick a place where the servers know you and give you outstanding service. You’ll look like a VIP. Nothing is more impressive than being greeted by name when you enter a restaurant. Try not to cancel or reschedule. Before asking a client to lunch, check your calendar twice—and then again. Plans do change, but changing your plans at the last minute because you accidentally overbooked or accepted a better offer will make you look careless and disorganized. A business lunch is about impressing your clients; it's best not to give them any reason to question your ability to stay on schedule. Allow your client to order first, then follow his or her lead. Be aware of your client’s dietary restrictions. I once went out to dinner with a group of friends and the host took us to a steak restaurant. One of the women in our group was Indian and didn’t eat meat for religious reasons. The host was embarrassed when he found out that she had ordered a vegetarian meal. 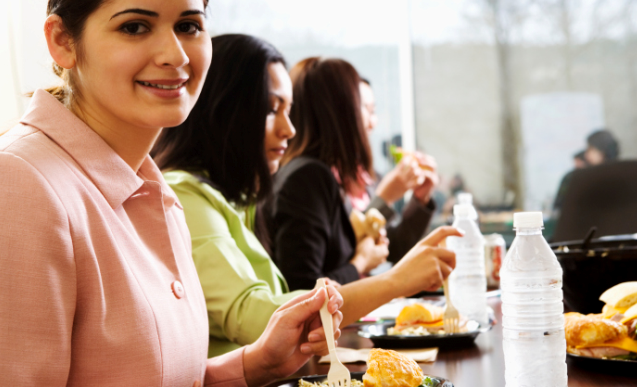 Mirror your client's preferences and lunch will go more smoothly. If your client orders just a salad and a glass of iced tea, follow suit. Don't go overboard and order a five-course meal. You're not a barbarian; you're an entrepreneur. Basic manners are a must. Don't chew with your mouth open. Use your napkin and never overindulge in alcohol. As the saying goes, “Loose lips sink ships.” You know the basics; now put them to good use. A business meal should be more about the business and less about the meal. Get to know your client through dynamic conversation. Ask open-ended questions. Be interested and interesting and the conversation will flow organically. Don't be afraid to share a few personal stories, it will remind your client you're human and allow you to establish a personal connection. Just keep it appropriate and don't share your deepest, darkest secrets. Your email can wait. Turn your phone on silent and leave it in your pocket or handbag. You may have trained yourself to respond to every beep and buzz, but give your client your undivided attention. You attentiveness will show your dedication to your client and their business.